Docs With Apps developed our OWN app! 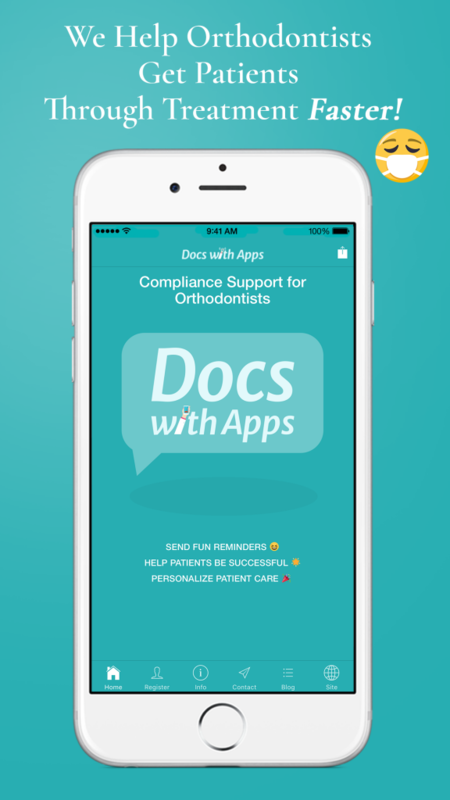 It is important to us, that each of you has the opportunity to see for yourselves, what a tremendous benefit, having a custom orthodontic compliance app can be for your practice. We want you to experience what it would be like to have an app of your own. Docs With Apps would like you, your team members, and your patients to be able to test drive the app, check out its features, and experience the reminders for yourselves. We know that compliance is something that is stressed with every patient at every visit. Having your own app allows you to support your patients outside the four walls of your office. How is your compliance app set up? Docs With Apps is a company that you can rely on to have your best interests at heart. We were founded by an orthodontist and a designer. We have the knowledge and the experience needed to personalize an app for you and your practice, and provide the support and updates that are required to keep it functioning at peak capacity for the life of your practice.